Year 2014 was characterized by a challenging environment with low growth, low interest rates as well as increased geopolitical tensions. Despite the headwinds, Nordea showed a robust result with stable income, decreased costs and improved credit quality. The challenging environment signals weaker expectations for a global economic recovery, which also affect the export-oriented Nordic economies. 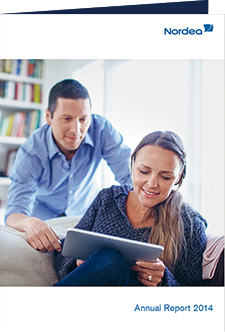 In 2014, Nordea continued to welcome more new relationship customers and were trusted with more savings, thereby passing the milestone of EUR 250 billion in assets under management. Despite the challenging environment, income was stable, driven by net fee and commission income and Nordea is on track to deliver on its cost targets. Credit quality continued to improve and the loan loss level is below the 10-year average. Nordea was once again confirmed as one of the safest banks globally, when issuing two Additional Tier 1 instruments, of in total USD 1.5billion with the lowest coupons among corresponding instruments issued in the USD market. This strengthened the Tier 1 ratio by 75 basis points and the total capital ratio is above 20 per cent. Common equity tier 1 (CET1) capital ratio improved 1.8 percentage points to 15.7 per cent. The rapid change in customers’ preferences towards using online and mobile solutions, as well as the increasing operational regulation, is transforming banking industry. To enable Nordea to develop even more personalized and convenient services to customers in the future, Nordea is currently simplifying processes in all parts of the bank. Nordea will, as part of this process, build new core banking and payment platforms, significantly increasing agility, scale benefits and resilience. Nordea’s vision is to be a Great European bank, acknowledged for its people, creating superior value for customers and shareholders. Nordea is making it possible for customers to reach their goals by providing a wide range of products, services and solutions within banking, asset management and insurance. Nordea has around 11 million customers, approximately 700 branch office locations and is among the ten largest universal banks in Europe in terms of total market capitalization. The Nordea share is listed on the Nasdaq Stockholm, Nasdaq Helsinki and Nasdaq Copenhagen exchanges.